I was introduced to spinning many many years ago. After about 20 minutes I decided it was way too hard and I would likely die in my own pool of sweat. I never went back. That is until about 4 years ago. My local gym was offering a spinning class and I just had to try it again. I went, I perspired (a lot), I felt like I would die or perhaps puke, and then it was over and I felt amazing. What? Is this so? So I decided to go back. Each time I did a little more, worked a little harder, and felt even better. I became officially hooked! Your heart may pump at 80% capacity versus the average 50-65%. Not only does spinning increase calories burned but it also improves metabolic function. One hour of spinning can get you burning anywhere from 800-1,200 calories. If your ‘problem’ areas tend to be abs, thighs and hips; spinning might be your new best friend. While you will get a total body workout the majority of working muscles are your core, hips, and you guessed it your thighs. If you suffer from osteoporosis, back problems, and knee problems you may actually worsen your condition. So make sure to take it easy and consult a physician to ensure you are not doing more harm than good. Most gyms offer spinning classes as part of a yearly or monthly membership which if coupled with other exercise routines provides variety and a more cost effective approach to beginners and seasoned spinners. 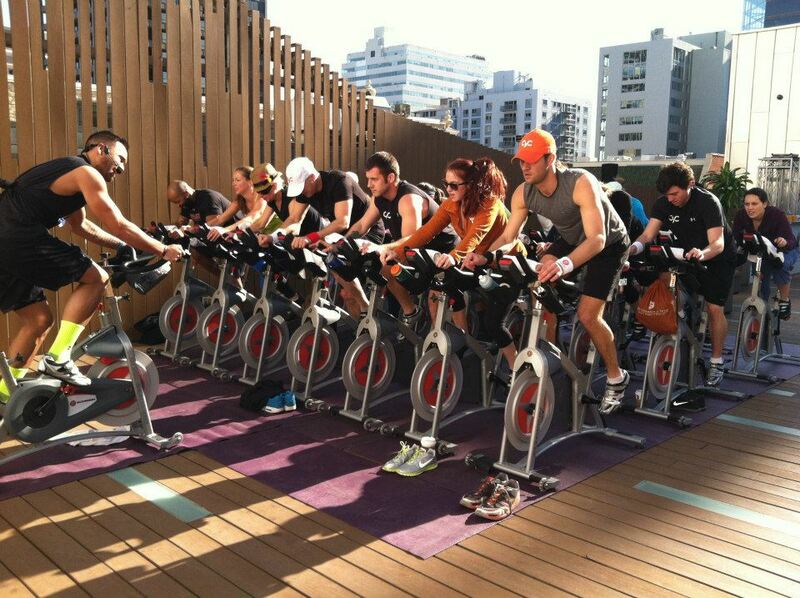 Many cities/towns are now offering spinning studios dedicated solely to offering spinning classes throughout the day. This is convenient for those only interested in spinning as their form of exercise, as well as those who have constricted schedules and looking for classes they can slip in and out of at convenient to their schedule. These studios are also starting to offer spinning shoe rentals so if you are not ready to go all in on investing in “clips” or spinning shoes you can rent them and then decide. Some of these studios have also begun offering yoga or TRX type classes in their daily class schedule so members can add a little flare to their weekly workout routine. There are some people who are just not interested in going to the gym at all; but want to incorporate spinning into their lifestyle. The great thing about spinning is just like owning a treadmill or at home machine you can purchase equipment like a spinning bike or if you have a road bike a trainer for said road bike and spin at home. Convenient and likely the most cost effective. There are many spinning DVD’s available for purchase; and cycle shops in most towns also offer spinning dvd rentals if you tend to get bored easily. If you have ever thought of trying this form of exercise; I highly recommend it. Don’t get me wrong this is no ‘walk in the park’. Spinning is strenuous hard work, but the pay-off and the feeling of accomplishment after finishing an hour of spinning is well worth the work. Previous Post Get it Straight!